*I can't say I remember the context of using that phrase, but I definitely remember sing-song saying it in elementary school. Are pumpkin eaters innately bad? I hope not, you know, because of the pie. Her face said it all as she walked to the car Friday afternoon. Before she even settled herself into her booster seat Annelise began to confess her crime. Her face crumpled and she blurted, "I got moved on yellow because Mrs. B. caught me cheating on my spelling test." She took in my dropped jaw and general look of shock spreading over my face. She continued, now through tears, " But Mrs. M. (her other teacher) says that mistakes are wonderful opportunities to grow and learn and I've learned my lesson and I'll never, ever do that again. I'm soooo sorry." I could not wrap my mind around what my sweet little first grader was telling me. Was she really telling me through her hiccups and sobs that she got caught cheating on her spelling test? We drove home in almost silence because I was too mad to say anything right then. Plus I had no earthly idea what to say. Once we got home and got ourselves sorted and settled, we sat down together on the couch and she shared the complete story of her crime with all its wretched details, with several breaks for deep breaths, nose-blowing and hugs. The back story to this is that she only had to study five challenge words this week since she made a 100 on her pretest on Monday (the challenge words test might not have even counted for a grade). 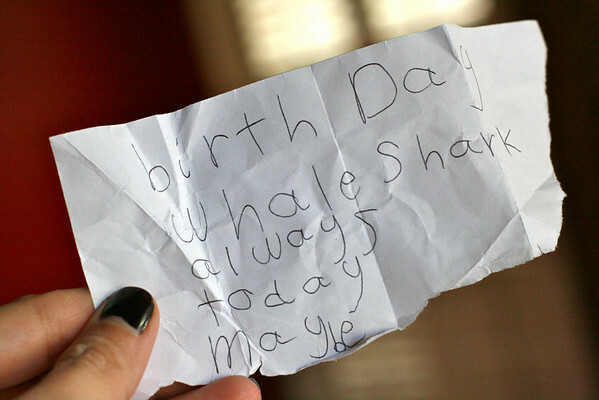 We worked on these five words (today, birthday, maybe, always and whale shark) all week and she knew them. She did. She even spelled them one more time Friday morning as we drove to school. Yet she doubted herself. Enough so that Thursday night before she went to sleep she wrote her words on a scrap of paper. Friday morning as she was getting dressed she tucked her cheat sheet into her shoe and then scampered on downstairs to eat breakfast. That's right, she put it in her shoe. Someone who is either a spy or at least street wise and conniving. Certainly not an innocent seven year old first grader. Before the test she took her shoe off, retrieved her cheat sheet and put it inside her desk. She said she only used it to check her words, not copy them, but that really doesn't matter, it was still all kinds of wrong and thankfully Mrs. B. caught her. She had to deal with the humiliation of being caught cheating, she had to talk to Mrs. B. about it, after a whole week of good behavior her clothespin was moved to yellow, she had to sit out for part of recess and then deal with the impending doom of having to tell us about her misdeed later that afternoon. We talked about how wrong her actions were, how it was worse because she planned it out and it wasn't a spur of the moment thing, how would she have felt if she had gotten away with it (she said guilty, but I can't help but wonder, I hope she would have had a guilty conscience), how her teachers and I need to trust her in all situations, and how cheating is handled in some cases (zero grades, expelled from school, fired from a job, etc.). She repeatedly expressed her deep remorse and made promises that she would never, ever do this again. I also asked her where she got the idea in the first place to do something like this (a book? TV show? movie?) and she assured me she thought it up herself. I think we may be in trouble. When asked why she did it, since she had been practicing the words all week and should have felt confident that she knew them, she explained she was worried she wouldn't make a 100 and therefore wouldn't get a piece of candy after the test. I wonder if any other criminals got their start motivated by perfectionism and candy? As for punishment, well, part of it was the ordeal of telling me, then Scott and then Pappo and Grandma later (she went to their house that afternoon while I went to the already scheduled conference with her teacher) what had happened, because she got so worked up emotionally each time she told it. She also lost her Nintendo DS and TV for a week and will write a letter of apology to Mrs. B. Scott and I debated whether she should skip the high school football game they had planned to go to that night, and with possible selfish motives since Scott really, really wanted to go, we decided not to take that away. Honestly though, we weren't sure what an appropriate punishment should be since we've never dealt with this type of thing before. Have you ever had to deal with cheating with your littles? Any advice? Was our punishment really lame? Oh dear, premeditated cheating, that's quite a crime! Hopefully she felt so awful about it she won't ever do it again. I haven't had to deal with this one, so I don't have any advice for you. Good luck. We havent had to address cheating but for punishments of this sort I do the same thing-- 1st having to tell what they did wrong, apologize, and then I do a lot of the "I am disappointed that you chose to do wrong" speech and take away a privilege. For Griffin it's usually his DS, for Luci something else like staying up late reading. I am amazed that she thought to do this! Wow, that must have been disappointing. I think I would have had the same reaction you did. I think your consequences were right on too. You want her to feel sorry for what she did, but no one needs to be miserable and the outing with Scott was probably just what she needed to be reminded that mistakes are not going to lead to a loss of love. At such a young age kids can interpret things so drastically. Good luck navigating parenthood (and keep sharing so we all learn from each other). These things are so hard, aren't they? I like your punishments, I think they are appropriate. I especially enjoy using the "write a letter of apology" consequence. I even go so far as to make my kids write an essay on what they did, what they learned, how they could have handled it differently. (It is a selfish consequence because I really want to have a writer in the family!) I figure I can kill two birds with one stone; hone the writing skills and make them think through the whole event. I daresay, she won't be doing that again! Nothing worse than getting caught and the ensuing humiliation. Wow. I have nothing to say other than I think you handled it well. What a shock to the system. On another note, thanks for pushing my off the fence to finally buy Mindy Gledhill's cd. I had thought and thought about it and now I haven't listened to anything else for a week. sounds like you handled it well! hang in there! what is amazing to me is the things kids think up by themselves...mine are always catching me off guard. I like the comment above too that says sometimes the parents need time to think about it and let the kid stew about it. and telling grandparents, whew-that's tough too! As a first grade teacher.. I think you did good with the punishment. I am impressed her teacher only moved her to yellow. That would have been a jump to red action in my room! HA! I have had it happen 2 times in my 11 years of teaching. Both from smart kids (who more than likely would have made a 100 anyway) and came from good homes where the kids had been taught that this was wrong!! Thank you all for your encouragement and perspective. I certainly was stunned that she thought--plotted-this and went through with it. I hope she learned her lesson! I appreciate all of y'all's thoughts and comments!